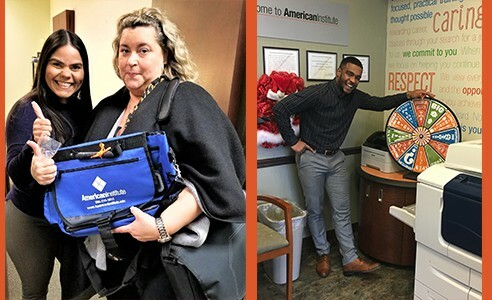 December 2017, All locations – Every day, American Institute students, staff, and faculty demonstrate their caring, generosity, and dedication to others without expecting anything in return. In December, students and staff who witnessed these acts of kindness could nominate their peers for recognition and tangible rewards. The “Do Good December” and “Be Sweet December” programs give the diverse American Institute community a way to celebrate the spirit of the holiday season by showing appreciation for each other and everything that makes our community so special. ‘Tattling’ is encouraged during this month-long celebration. Anyone can “call out” a fellow student or staff member who does something to benefit the community, such as staying late to help a fellow student with an assignment or organizing a carpool to help students get to class.